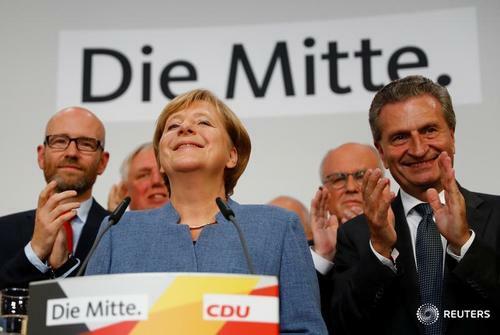 Chancellor Angela Merkel's conservatives secured a fourth consecutive term in office on Sunday in an election that brought a far-right party into the German parliament for the first time in more than half a century, exit polls indicated. 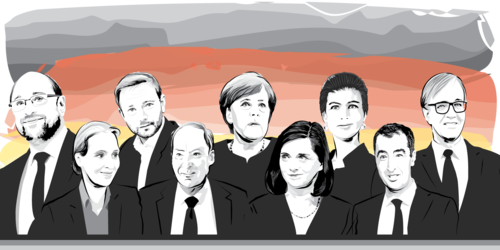 After shock results last year, from Britain's vote to leave the European Union to the election of U.S. President Donald Trump, many look to Merkel to rally a bruised liberal Western order and lead a post-Brexit Europe. 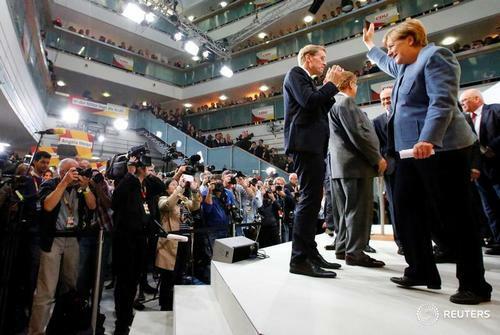 Merkel's conservative bloc - her Christian Democrats (CDU) and their Bavarian allies, the Christian Social Union (CSU) - won 32.5 percent of the vote, making them by far the largest parliamentary group, according to an exit poll for the broadcaster ARD. Their closest rivals, the centre-left Social Democrats (SPD), slumped to 20.0 percent - a new post-war low. 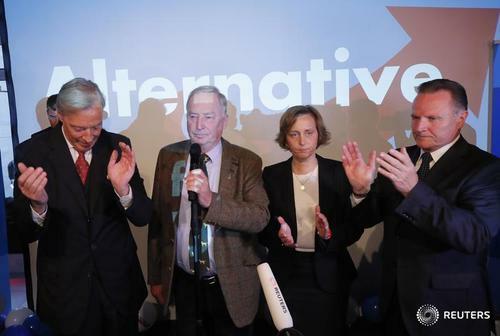 The far-right Alternative for Germany (AfD) stunned the establishment by finishing third and entering parliament for the first time with 13.5 percent. She must now form a coalition government - an arduous process that could take months as all potential partners are unsure whether they really want to share power with her. 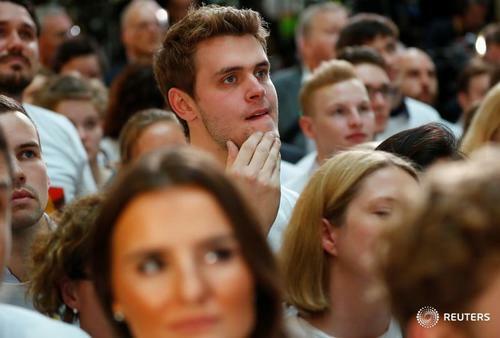 U.K.Chancellor Angela Merkel's conservatives secured a fourth consecutive term in office on Sunday in an election that brought a far-right party into the German parliament for the first time in more than half a century, exit polls indicated. CSU's Dobrindt says for all members of the government, this evening is a bitter disappointment. SPD leader Schulz says it is a bitter day for Germany's Social Democrats, we have lost the election. 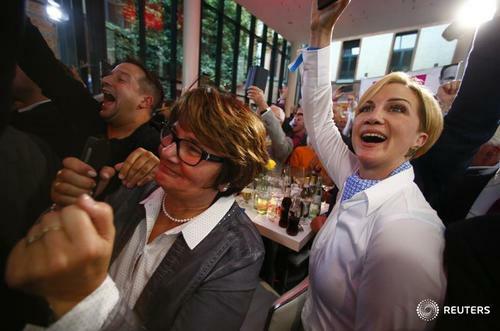 U.S.Chancellor Angela Merkel's conservatives beat their rivals on Sunday to win her a fourth term in an election that will also bring a far-right party into Germany's parliament for the first time in more than half a century, exit polls showed. SPD Deputy Party Leader Schwesig says result is a heavy defeat, for us this means the end of the Grand coalition, we will go into opposition. There is no question that Martin Schulz will remain as party leader. Merkel says, I am happy we reached the main goals of our campaign. 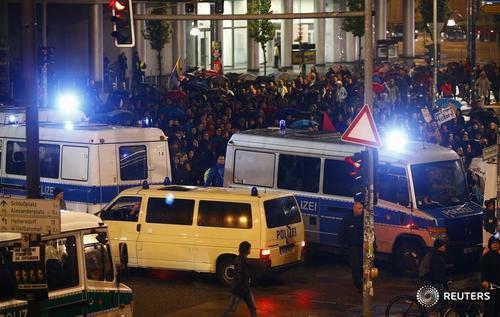 Germany's Merkel says - Of course we had hoped for a better result. I am still happy we reached the main goals of our campaign. We have mandate to form the next government and there cannot be a coalition without us. 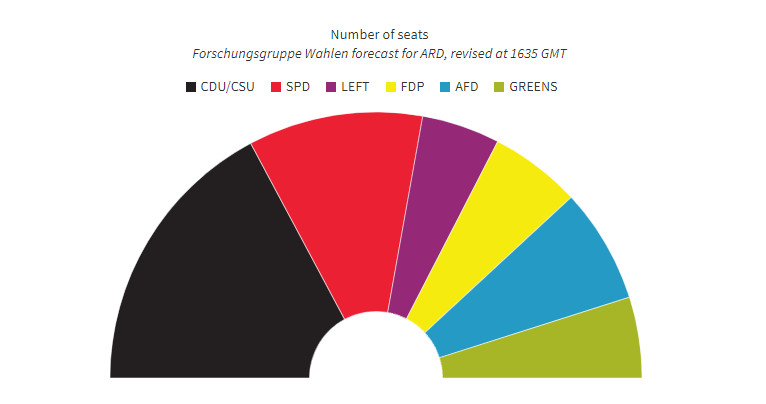 The AFD entering parliament is a big test for us. Merkel says - We must now lay the groundwork for economic prosperity in the coming years. We must keep the EU together and tackle migration challenges. 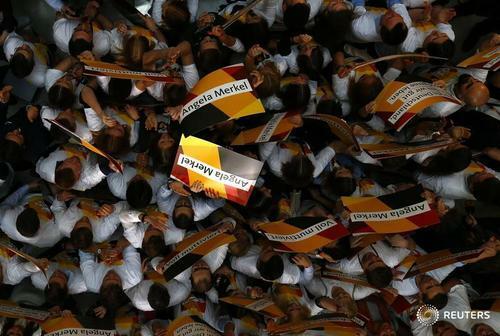 BERLIN, Sept 24 (Reuters) - German Chancellor Angela Merkel told supporters she had hoped for a slightly better result in Sunday's federal election, but added her conservative party still managed to reached its main campaign goals. "Of course we had hoped for a slightly better result. But we mustn't forget that we have just completed an extraordinarily challenging legislative period, so I am happy that we reached the strategic goals of our election campaign," Merkel said. "We are the strongest party, we have the mandate to build the next government - and there cannot be a coalition government built against us," Merkel added. Explore the Reuters graphics for more details on the results. 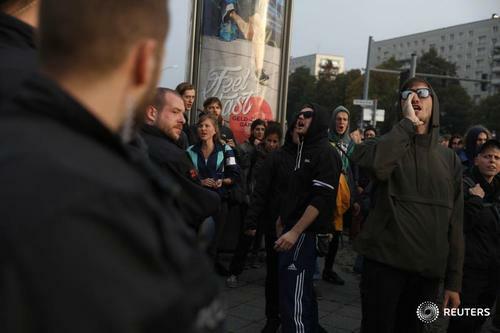 The European Jewish Congress expressed alarm at the far-right Alternative for Germany’s success in Germany’s parliamentary election and urged other parties not to form an alliance with the AfD. U.S.French far-right leader Marine Le Pen congratulated the far-right Alternative for Germany (AfD) party on its breakthrough result in Sunday's German parliamentary election. U.S.Chancellor Angela Merkel won a fourth term in office on Sunday but will have to build an uneasy coalition to form a German government after her conservatives haemorrhaged support in the face of a surge by the far-right. The European Jewish Congress on Sunday expressed alarm at the far-right Alternative for Germany’s success in Germany’s parliamentary election and urged other parties not to form an alliance with the AfD. Green party top election candidate Goering-Eckardt says - stronger Europe, climate change and social justice are priorities for us, we will see if there is enough common ground to join coalition negotiations. SPD leader Schulz says - I am certain that a Jamaica coalition will emerge in the end, the SPD's role is opposition.